I’m back, and now the internet can begin anew! Ah, sweet relief! 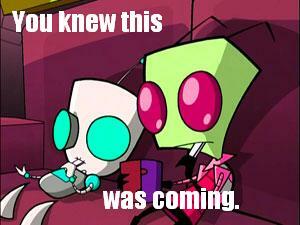 I can now repost Invader Zim pictures on the internet. Oh, how I’ve missed the internet! Indeed, I’ve had a wonderful time away, but I’ve missed a lot of things. Technology, mobile phones, the capacity to get to places without an hour long bus journey. But I’ve realised, now, though, that there are some things I haven’t missed. And chief among that list are adverts and TV. I’m not going to name anything, but just sitting here whilst I can hear the TV is making my blood boil. So crass, so intellectually poor. If it’s not a moron telling other morons that they’ve got the W-element*, it’s massive corporations trying to make more money. Also, it’s all so sublimated. Watch any advert break, and if you can work out what 30% of the ads are for before they’re over, then consider yourself lucky. (That is, unless it’s on the other end of the spectrum, and is just just yelling the brand name at you over and over.) I know a couple of smart kids who are still totally inured into this whole culture, to the extent that they actually play a game where they see who can work out the brand first. I find that a little soul-crushing. This is why I don’t watch TV. The world is full of “celebrity” idiots with poor grammar teaching people to talk like them, good songs being abused to shill a product, and advertising companies convinced that selling insurance is an art form. I’m just glad the internet is nothing like that. P.S. I know this all sounds really elitist, but is it too much to ask that there be fewer programs that are just formulated along the lines of “let’s get some ‘ordinary’ people in front of a camera and see what happens”. Surely that’s not too much to ask. * Still not naming anything.